Connect with 20 years of wonder and memories at the Aquarium of the Pacific. Join in on the 20th Anniversary celebration featuring special programs, events, exhibits and contests highlighting our fascinating history and bold future. Learn about and meet some of our original animals, such as Charlie the sea otter, Lou the turtle, and even a group of sea stars. And don’t miss some exciting new residents that have arrived just in time for the celebration including a baby harbor seal born in April to Shelby, on of the Aquarium’s original animals. The Aquarium has a new cephalopod exhibit in the Tropical Pacific Gallery called Tentacles and Ink. This exhibit will feature species of cephalopods, which include squid, octopuses, and cuttlefish. NOW OPEN, it houses a day octopus. Unlike most species of octopus, which are nocturnal, this species is most active during the day, hence its common name. It frequently changes the color and texture of its skin to blend in with the reef environment as camouflage. This species lives on coral reefs and in shallow waters in the Indo-Pacific Ocean, from Hawaii to the eastern coast of Africa. It feeds on fish, crabs, shrimp, and other small prey. Several contests, scavenger hunts, and community challenges are being offered, including daily opportunities to win prizes. Look for the platinum Bob the Diver statue hidden in a different exhibit each day and take and post photos at designated selfie stations with the hashtag #AOPandme and have the chance to win prizes. In addition, the Aquarium’s costumed characters, including a new octopus mascot named Gigi, will be celebrating with new photo-ready party accessories. A short film highlighting the Aquarium’s conservation work will play daily in the Great Hall, and art exhibits celebrating the Aquarium’s anniversary will be displayed on the second floor. The first art exhibit features five original pieces by Brian Kesinger, the Official Artist of the 20th Anniversary. Kesinger is an award-winning story artist, author, and illustrator whose 20-year career at Disney spanned both hand-drawn and CG animated films. He is a longtime Aquarium fan and member who has also created a series of books about a character named Victoria and her octopus friend, Otto. Our gift store will be featuring his set of four limited-edition pins featuring charter animals from the Aquarium. Prints of Kesinger’s exhibiting artwork will also be available for purchase. Kesinger’s art exhibit will be up through September 2, 2018. Come and celebrate with us at the Aquarium of the Pacific! you can touch. . . and some you can’t! Experience the ups and downs of life on land and sea in the coming of age story starring the cutest sea turtle on the big screen. From the warm waters of the tropics to the icy Antarctic, join Sammy and his friends on an exciting journey through truly immersive environments. Wind your way around spectacular coral reefs and enjoy a wild ride on a fun-loving octopus. Mobile Movie Tickets Available! Tickets may be purchased, viewed and redeemed/scanned right from your smartphone! Family Memberships are Available for Kern Value Card Members ONLY! Please verify your Kern Value Card membership by filling out & submitting this form. 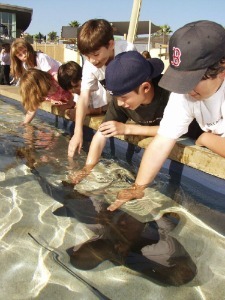 Please visit the Aquarium of the Pacific website and plan your next adventure!